After the Battle of Antietam on 17 Sept. 1862, Gen. Robert E. Lee and the Army of Northern Virginia recrossed the Potomac River into Virginia. After President Abraham Lincoln’s constant urging, the Union Army of the Potomac, led by Maj. Gen. George B. McClellan, pursued them. Lee ordered part of his army south to Culpeper Court House. To screen Lee’s march, Maj. Gen. J.E.B. Stuart’s troopers fought a series of engagements against the probing Federal cavalry. 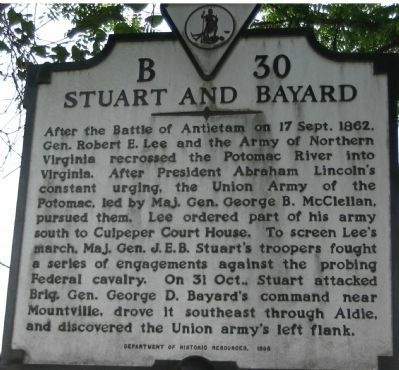 On 31 Oct., Stuart attacked Brig. 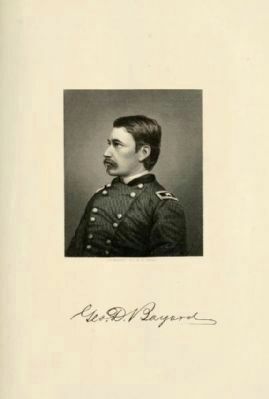 Gen. George D. Bayard’s command near Mountville, drove it southeast through Aldie and discovered the Union army’s left flank. as the crow flies. A Revolutionary War Hero (here, next to this marker); Gettysburg Campaign (here, next to this marker); Cavalry Battles (here, next to this marker); Sergeant Major John Champe (about 500 feet away, measured in a direct line); Battle of Aldie (approx. 0.7 miles away); Snickersville Turnpike (approx. one mile away); First Mass. Cavalry (approx. 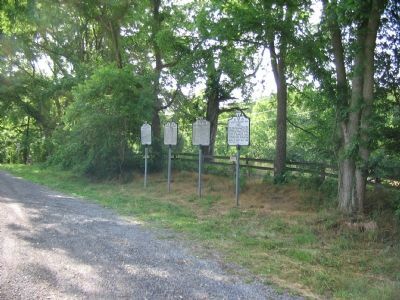 1.2 miles away); a different marker also named Battle of Aldie (approx. 1.2 miles away). Touch for a list and map of all markers in Dover. More. Search the internet for Stuart and Bayard. Credits. This page was last revised on June 16, 2016. This page originally submitted on June 28, 2007, by Craig Swain of Leesburg, Virginia. This page has been viewed 2,093 times since then and 12 times this year. Photos: 1, 2. submitted on June 28, 2007, by Craig Swain of Leesburg, Virginia. 3. submitted on August 7, 2011, by Henry T. McLin of Hanover, Pennsylvania. • J. J. Prats was the editor who published this page.